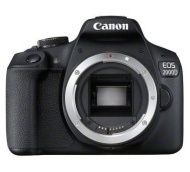 alaTest has collected and analyzed 46 reviews of Canon EOS 2000D / Rebel T7. The average rating for this product is 4.2/5, compared to an average rating of 4.3/5 for other Digital Compact Cameras for all reviews. Reviews about the portability and sensor are generally positive. The image quality and price are also appreciated, whereas the viewfinder and screen get critical views. We analyzed user and expert ratings, product age and more factors. Compared to other Digital Compact Cameras the Canon EOS 2000D / Rebel T7 is awarded an overall alaScore™ of 95/100 = Excellent quality. Canon's EOS Rebel T7 SLR camera features an upgraded image sensor, but is still way behind the curve in other areas. 24MP image sensor. On-screen shooting guide. Raw support. Sharp LCD. Wi-Fi-enabled. Inexpensive. Fixed rear LCD without touch input. Dated image processor limits high ISO capture. Autofocus not available when recording video. Slow 3fps burst rate. It gets a slightly higher-resolution sensor over the T6 -- more megapixels -- and that's all. Canon EOS 2000D review: Is this the sub-£500 DSLR you're looking for?